Eye catching bright yellow new spring growth turns bright orange/red in winter. The sculptural branches of Euphorbia 'Fire Sticks' look terrific in pots or in the garden. Colder climates will see a more intense colouring and it is at its best throughout the winter. CHGC member Margaret has some really good examples of Fire Sticks growing in her Avocado Heights garden. They are low care, drought tolerant plants and garden designers really love them because of their popping colour and strong architectural lines. Prune lightly to keep it compact and colourful. Like all Euphorbias, the sap is toxic and should not come into contact with the skin - wash immediately if it does. Plant into well drained soil in a sunny to bright light position. Water to establish, then keep just moist, reduce water in winter, so this plant is a good choice for the Coffs Coast. Fire Sticks is also known as Aveloz, Firestick Plants, Indian Tree Spurge, Naked Lady, Pencil Tree, Pencil Cactus, Sticks on Fire, Finger Tree or Milk Bush....... how about that for a line up of names! 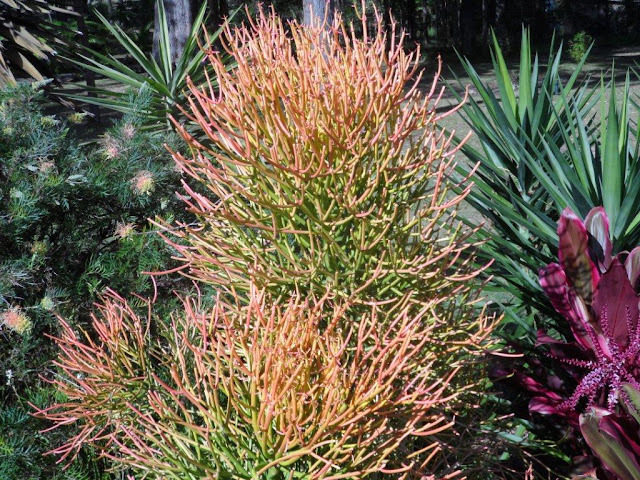 The name Fire Sticks will do us nicely for this article, is an amazingly interesting plant with its naked green stems resembling coral with vibrant orange/red tinged tips in winter. Margaret says it is very easy to take cuttings from and she has used it to great effect in her garden for that WOW factor!